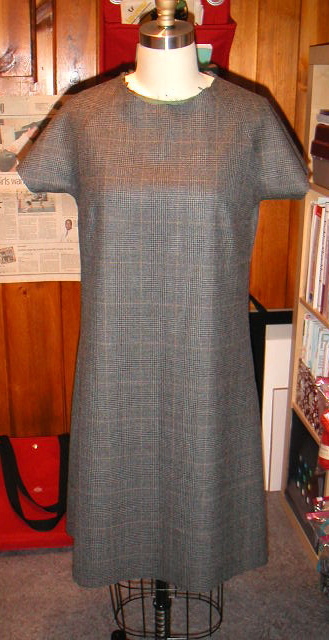 After finishing the fez on Friday night, I finally starting working on the wool dress. I think I was procrastinating because I didn't want to deal with both the lining and the dress, but once I got started it all went quickly. I sewed the lining together first and then proceeded with the dress. The thing that took the most time was the inseam pockets. The original pattern does not have a lining, so I had to figure out how to situate the pockets with it and the dress. I had the pockets sewn into the lining, but was not happy with how they looked after topstitching the edges of the pockets to the dress. It was a little messy and the edges weren't too clean. So, I scrapped the pockets and ripped them out. I'm still thinking about maybe adding some patch pockets to the front, but I'm not sure. I've still got to sew in the bias trim on the neckline and hem the sleeves and the bottom edge. I was thinking about adding bias trim to those edges as well. The bias would make the dress a little less formal, but really really cute. It looks great!